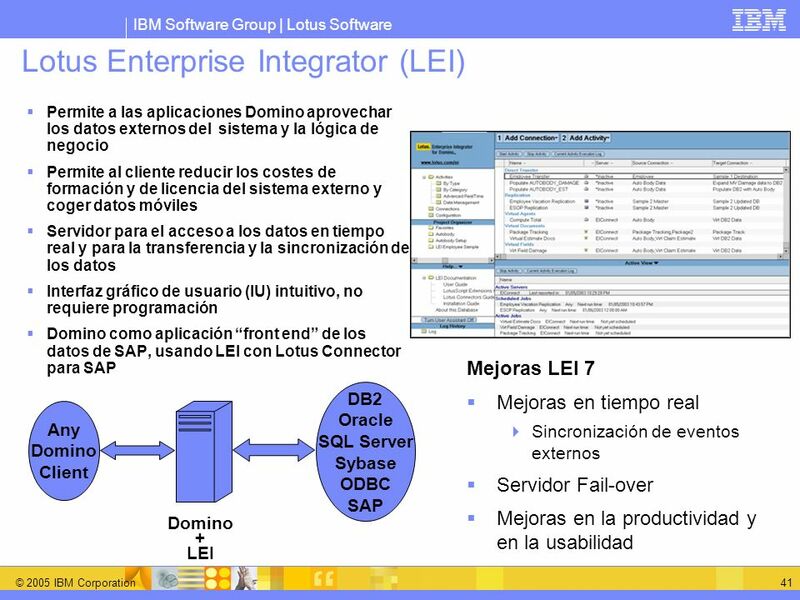 Opciones de Integración DB2 Mejoras en la usabilidad Mejoras en la productividad Nuevas características adicionales The majority of this session addresses the changes in Lotus Domino Designer 7. There will be an overview of the additional capabilities and improvements in LEI and Workflow. The remainder of the time will be spent on IBM Workplace Designer and related tools and features. 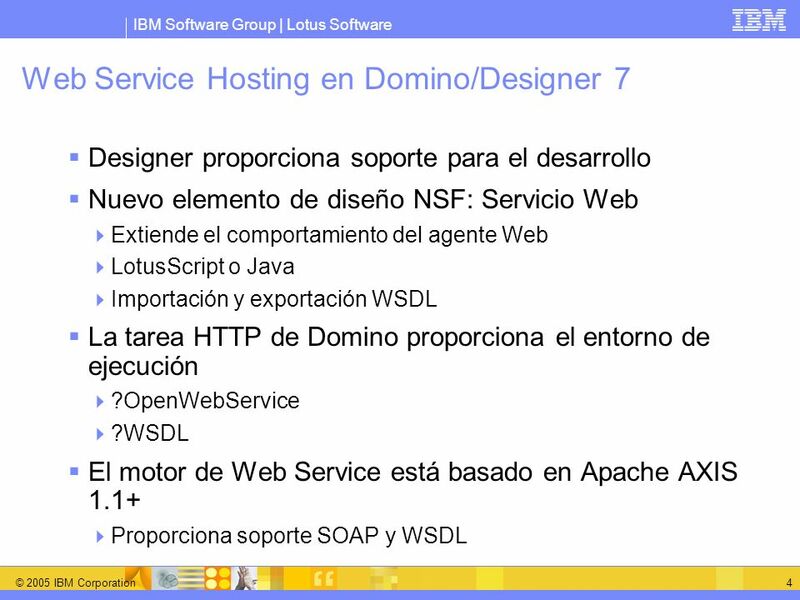 Designer proporciona soporte para el desarrollo Nuevo elemento de diseño NSF: Servicio Web Extiende el comportamiento del agente Web LotusScript o Java Importación y exportación WSDL La tarea HTTP de Domino proporciona el entorno de ejecución ?OpenWebService ?WSDL El motor de Web Service está basado en Apache AXIS 1.1+ Proporciona soporte SOAP y WSDL In Domino 7, Web Services are supported as provider entities (Note: not consumer entities) on the Domino server through HTTP task, no additional configuration of the server is required. Domino Designer 7 provides the new web service design element that can be added to any database. The web service is an extension of web agent (i.e. has similar properties) and can be coded in LotusScript or Java, making use of the skills you currently have. Domino 7 server supports web services through the HTTP server task and uses SOAP (Simple Object Access Protocol) 1.1 messages and supports WSDL (Web Services Description Language) The WSDL is an XML document that includes all the pertinent information required by the web service consumer including the name of the web service, names of operations and operation parameters of operations that can be called by the web service consumer. HTTP task is used to access and trigger the web service on Domino server. ?OpenWebService can be used in a POST request to invoke the web service and get the response(s). ?OpenWebService can be used in a GET request to produce the Web service's port name and the names of the operations for the port. ?WSDL command retrieves the WSDL document You can create the web service anew and code the implementation and value type classes. (Note: The implementation class of the web service is what is triggered by the web service consumer. Value type classes are optional additional public classes in the web service.) Or you can import an existing WSDL document and the skeleton of the implementation and value type classes will be creating, allowing you to code theses classes and methods. You can also use the Domino Designer to export the WSDL document from the web services design element. Mostrar WSDL Web Services Screenshot of Domino Designer 7 looking at the design list of web services in a database. Notice that web services are now available in Domino Designer under Shared Code. The button “show WSDL” has been selected and this shows the WSDL document from the selected web service. 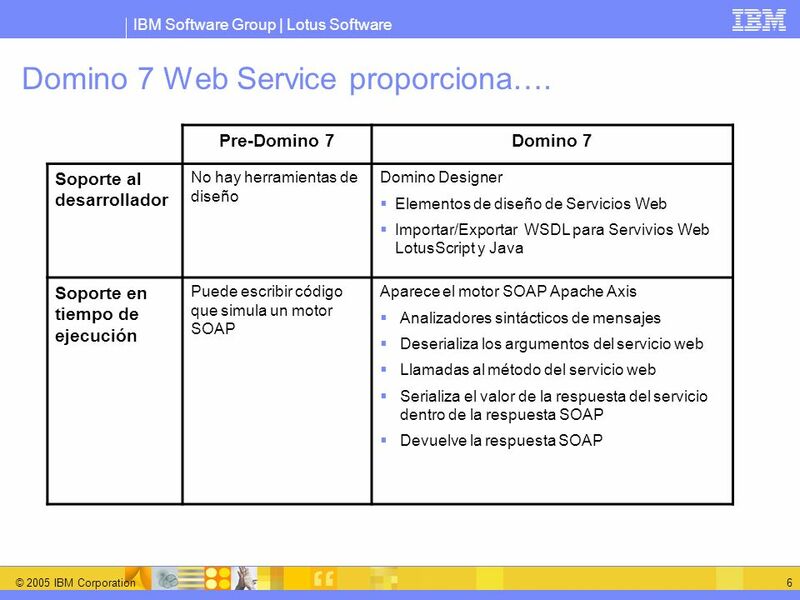 6 Domino 7 Web Service proporciona…. 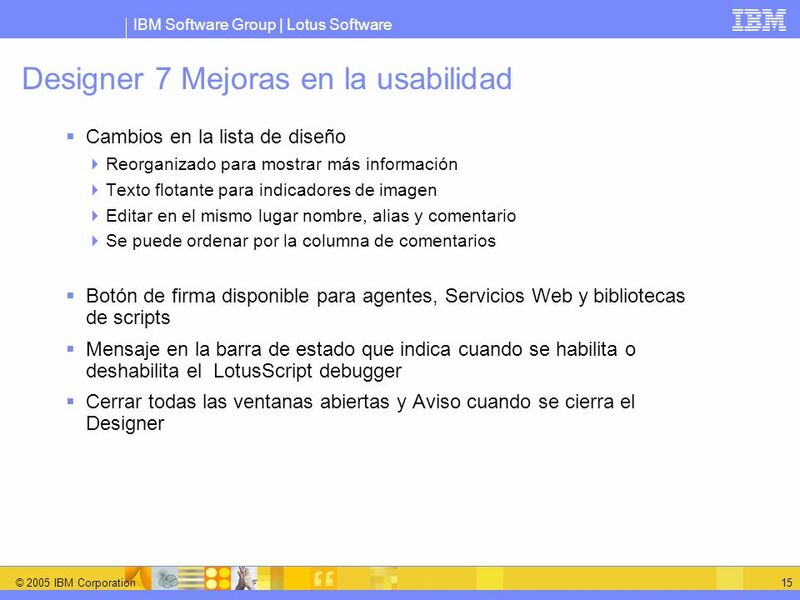 Pre-Domino 7 Domino 7 Soporte al desarrollador No hay herramientas de diseño Domino Designer Elementos de diseño de Servicios Web Importar/Exportar WSDL para Servivios Web LotusScript y Java Soporte en tiempo de ejecución Puede escribir código que simula un motor SOAP Aparece el motor SOAP Apache Axis Analizadores sintácticos de mensajes Deserializa los argumentos del servicio web Llamadas al método del servicio web Serializa el valor de la respuesta del servicio dentro de la respuesta SOAP Devuelve la respuesta SOAP This is a simply compare and contrast table. 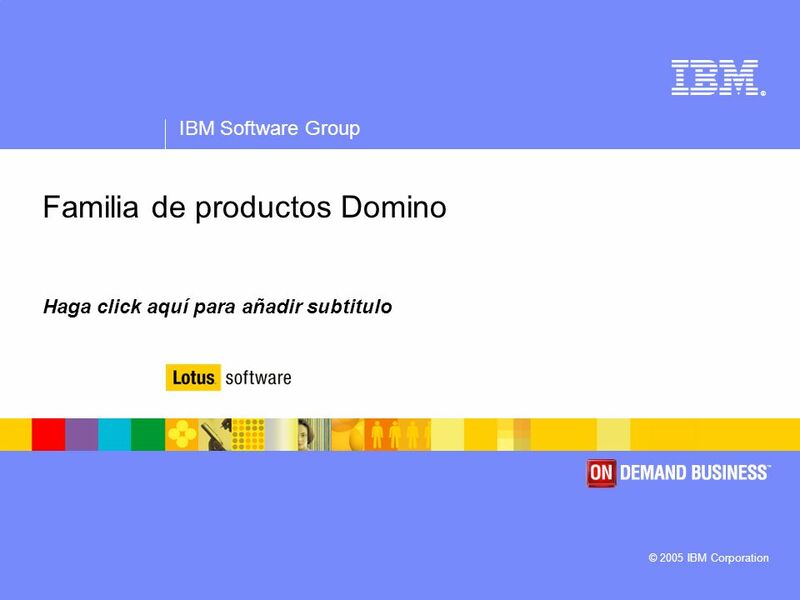 Experienced Domino developers can use earlier versions of Domino to create a web service, but this requires extensive development work. 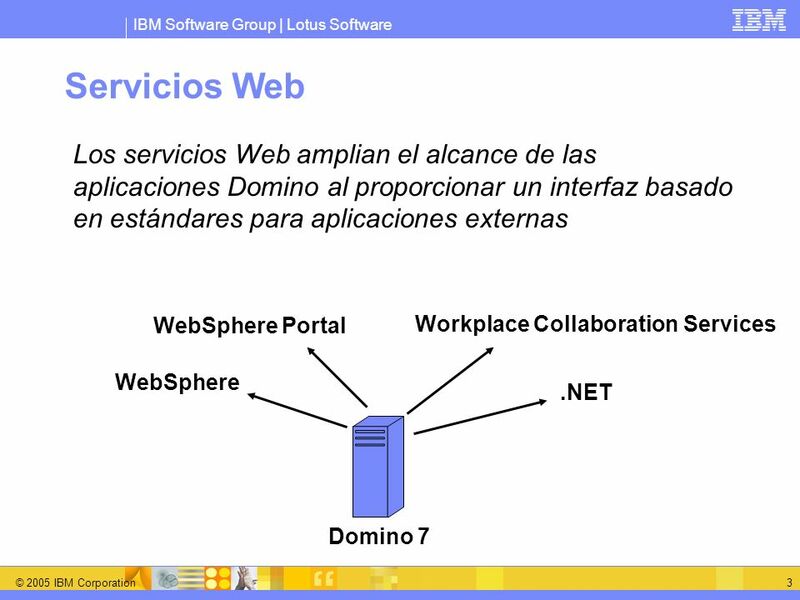 The new design element accessible through Domino Designer 7 and ready support on the Domino 7 server make it easier to create a web service and allows you easily to extend the reach of your Domino application and data to various Portal, Workplace Collaboration Services and .NET applications. 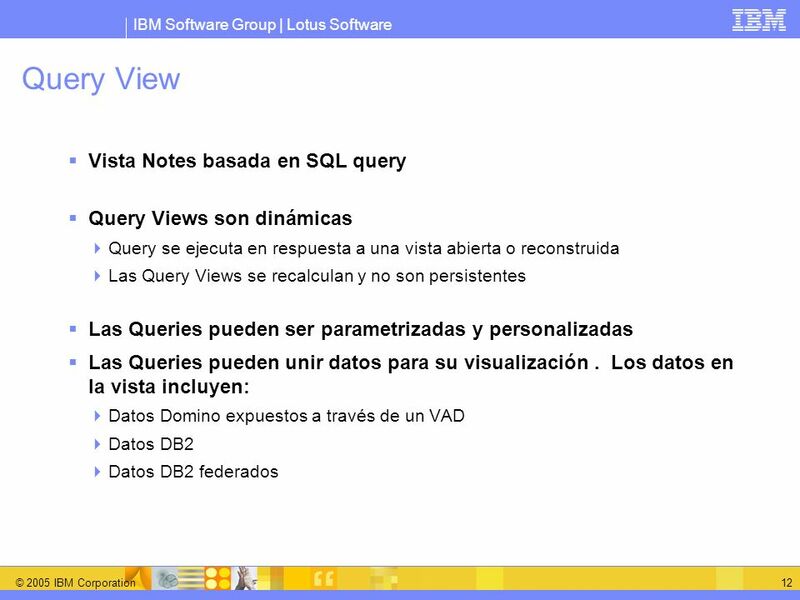 Expone los datos Notes a las aplicaciones DB2 Organiza los campos en vistas DB2 Query views Permite generar vistas que ataquen datos DB2 La instrucción SQL describe la selección Se calcula dinámicamente Poder de búsqueda con SQL (joins, etc) There are two options that are available for databases that are DB2 enabled. DB2 enabled means the server has been configured to use the optional DB2 data store and the specific database is stored in DB2. There are multiple configuration steps to be completed on the server and in the Domino Directory (detailed in Domino Administration Help database). 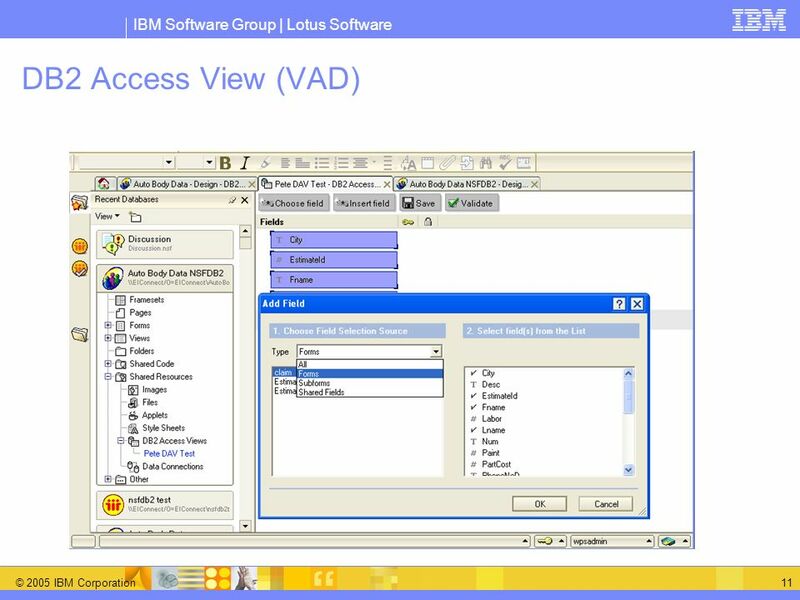 The first option for a DB2 enabled database is the DAV (DB2 Access View). 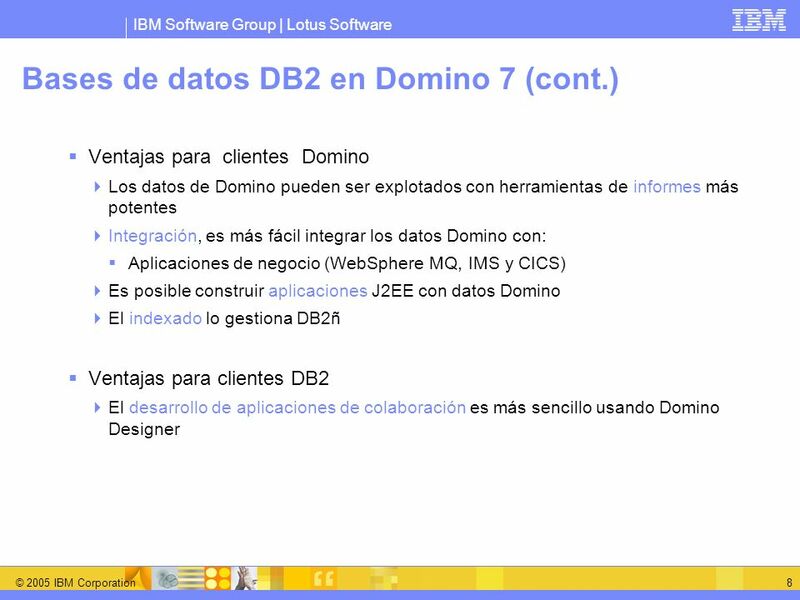 This option allows you to take a subset of the Domino database and publish it as a DB2 view. Once it has been published as a DB2 view, it is available to DB2 applications. The Domino security semantics are still supported in this scenario. 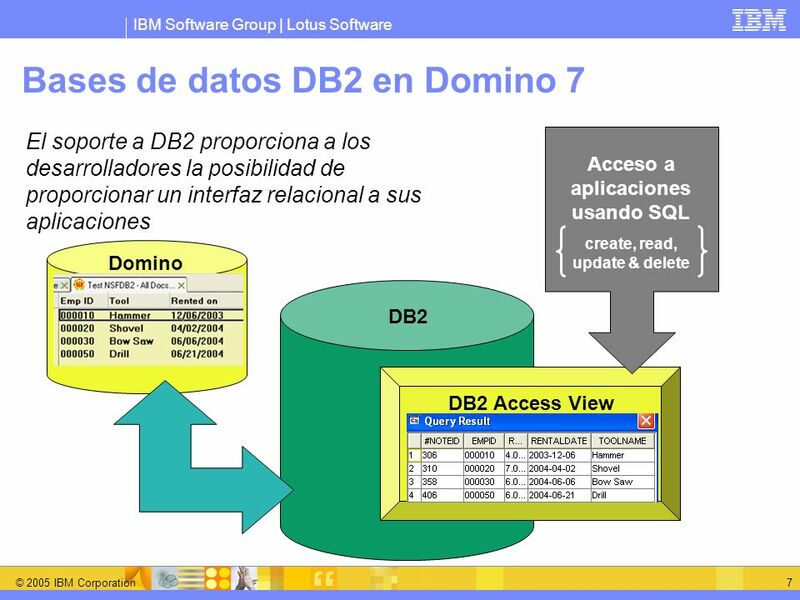 The second option for a DB2 enabled database is the query view. This view type uses a standard SQL statement to pull information from DB2 into a Notes view. If Notes data was published into DB2 through a DAV, that data can be displayed through a query view. 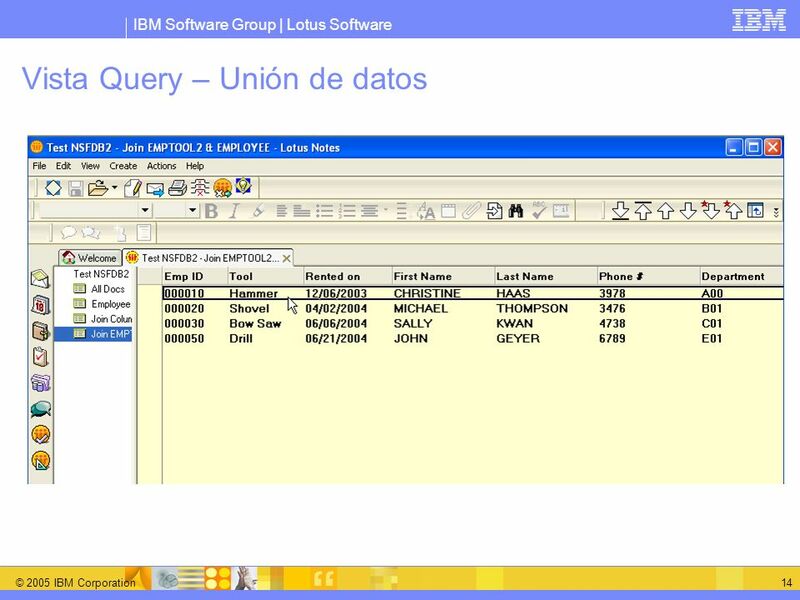 Also, DB2 data and DB2 federated data can be shown in a query view and joined for view display. Note (this is background information): The query view feature is available to Notes 7.0 clients for server based databases. The supported server platforms for query views in the initial 7.0 release are Windows and AIX. Other platforms will be supported in future releases of the server. A future release of Domino 7 will support these query views for browser clients. 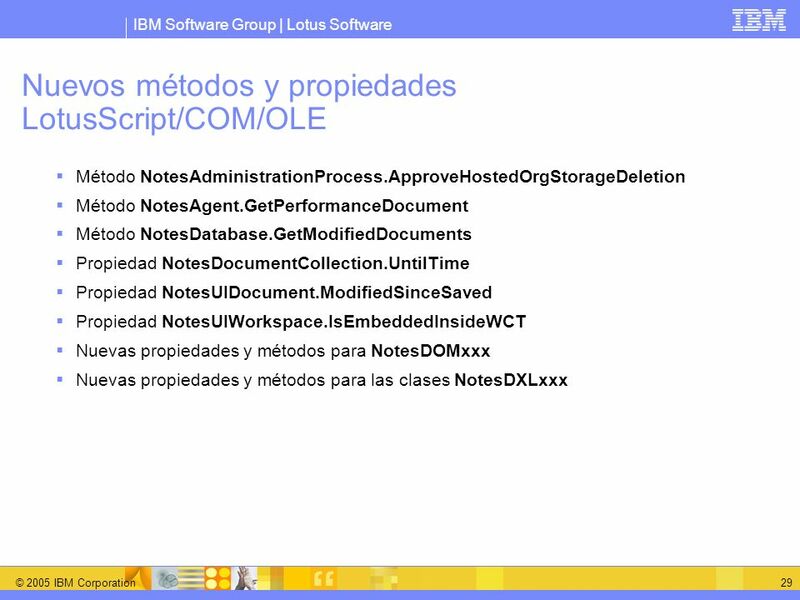 Mejora capacidad de generar informes de datos Domino Lectura de datos Notes, con semánticas de seguridad Domino (ACL's, reader lists) Herramientas de terceros para la generación de informes pueden trabajar a través de ODBC/JDBC Los datos Domino se pueden modificar a través de DB2 Insert, Update, y Delete con semántica Domino Soporte de conflictos replica/salvado, bloqueo de documentos The bullets here are self explanatory. Query se ejecuta en respuesta a una vista abierta o reconstruida Las Query Views se recalculan y no son persistentes Las Queries pueden ser parametrizadas y personalizadas Las Queries pueden unir datos para su visualización . 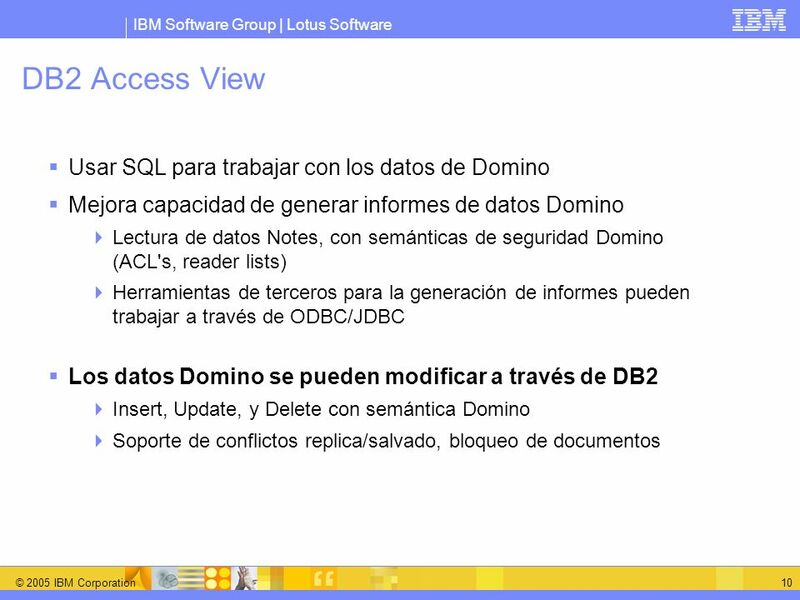 Los datos en la vista incluyen: Datos Domino expuestos a través de un VAD Datos DB2 Datos DB2 federados A query view is an additional view type that can be created within any DB2 enabled server based databases. 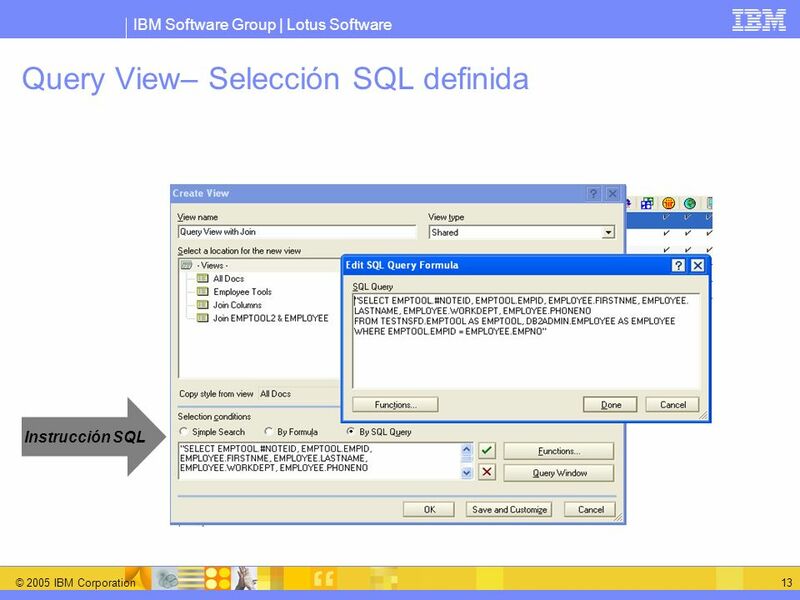 The selection formula for the view uses SQL and the view can include DB2 data, DB2 federated data and Domino data that was published to DB2 through a DAV (DB2 Access View). Query views are not persisted means they are not stored in the NSF and are recalculated when the view is opened or when the user refreshes Parameterized and personalized means you can use to concatenate the SQL statement The server administrator and the application developer can set the maximum number of rows returned to the view by the SQL query. The server administrator can set the value in the server’s NOTES.INI and the developer can set the value in the view properties for the query view. Instrucción SQL This is a screen shot of a query view being created through Create >> Design >> View. Please notice the third option “By SQL Query”. This is where the developer can input the SQL statement for the query view. and string constants can be used to form the valid SQL statement. Data from DB2 Access View Data from Different DB2 App This is a screen shot of a query view in the Notes 7 client. Since a query view can select information that has been published to DB2 through the DAV feature and can select DB2 data and DB2 federated data, this view is possible. The first three columns are from information from the current database that was published through a DAV. The last four columns are information from DB2. This data has been joined for display in this query view. 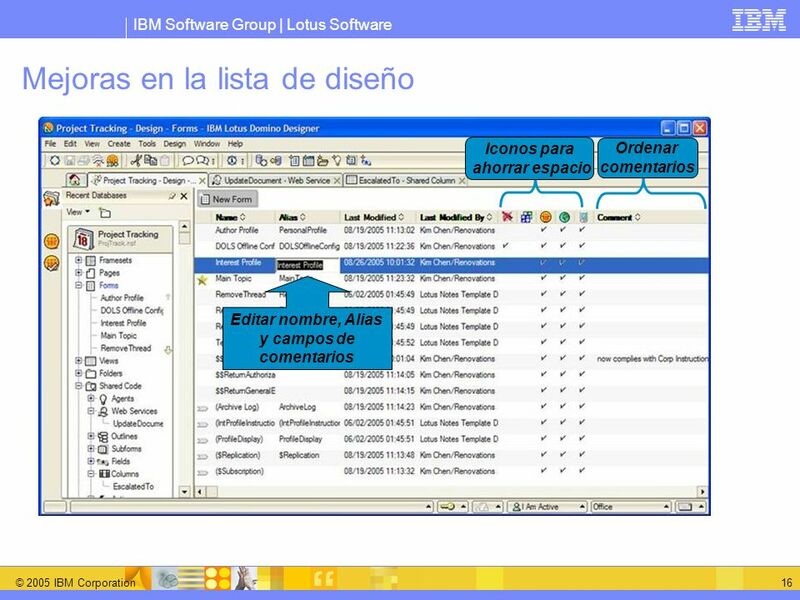 Iconos para ahorrar espacio Ordenar comentarios Editar nombre, Alias y campos de comentarios This is a screenshot of the Domino Designer 7 interface, showing some of the various changes have been made to help the developer be more productive. The name, alias and comment attributes of the design elements can be directly edited on the design list. Also, you can now sort the design list by the comments column in addition to the name, alias, modified date and modified by columns. The columns headed by icons represent from left to right (1) protect from design updates, (2) inherits from template, (3) available to Notes Client, (4) available to web and (5)available to mobile. 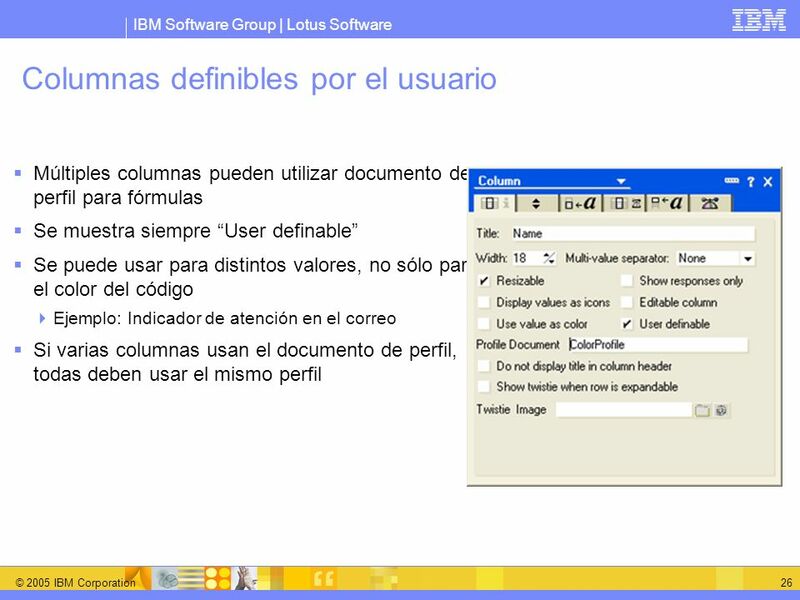 18 Columnas compartidas Reusar fórmulas y formatos de columnas comunes. 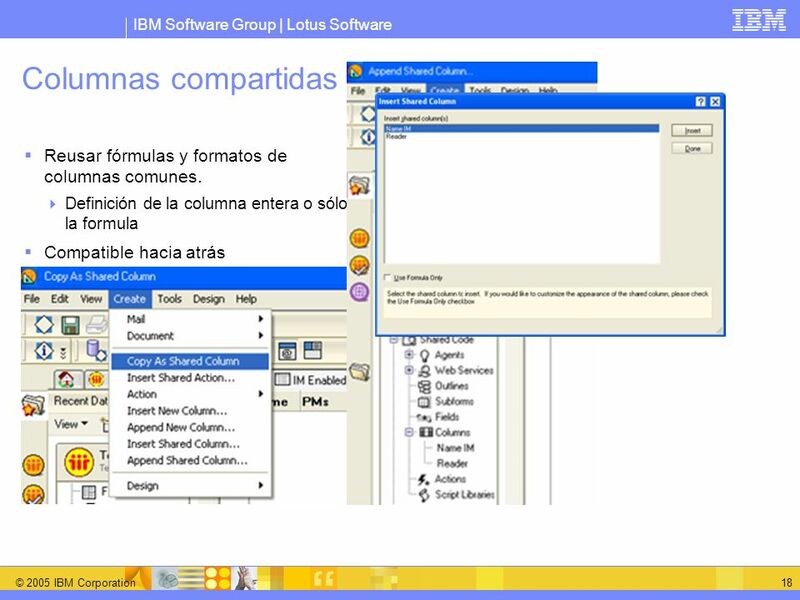 Definición de la columna entera o sólo la formula Compatible hacia atrás Shared columns are a huge productivity improvement. Shared columns can be used in views and folders within any one database. When the developer inserts a shared column into a view or folder, he/she can choose to use the entire column definition (formula and attributes) or the formula only. The shared column can be edited and those changes are propagated to the other views and folders that use that shared column. There is an additional option in the design list that will tell you which views and folders use that shared column. Shared columns are accessible from the web and from PRIOR versions of the Notes client. The top right screenshot shows that you can take an existing column and make it into a shared column. Note: The original column is not linked to the newly created shared column. 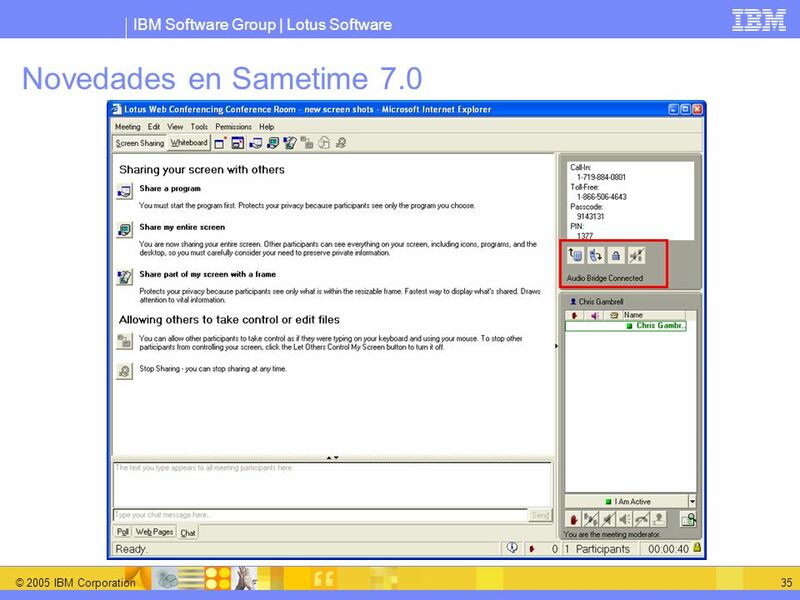 The second screenshot shows you that you can append and insert a shared column into an existing folder or view in Domino Designer and shows the dialog to choose the shared column to insert or append into the view or folder. All shared columns in the current database, are listed in this dialog. 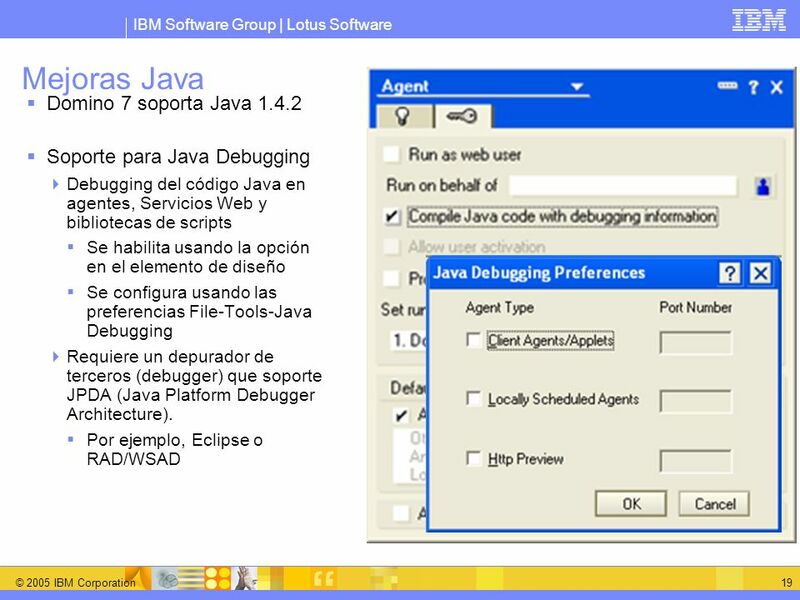 Debugging del código Java en agentes, Servicios Web y bibliotecas de scripts Se habilita usando la opción en el elemento de diseño Se configura usando las preferencias File-Tools-Java Debugging Requiere un depurador de terceros (debugger) que soporte JPDA (Java Platform Debugger Architecture). Por ejemplo, Eclipse o RAD/WSAD In addition to supporting Java 1.4.2, Domino Designer 7 lets you debug Java agents, web services and script libraries through a third party debugger that supports JPDA. 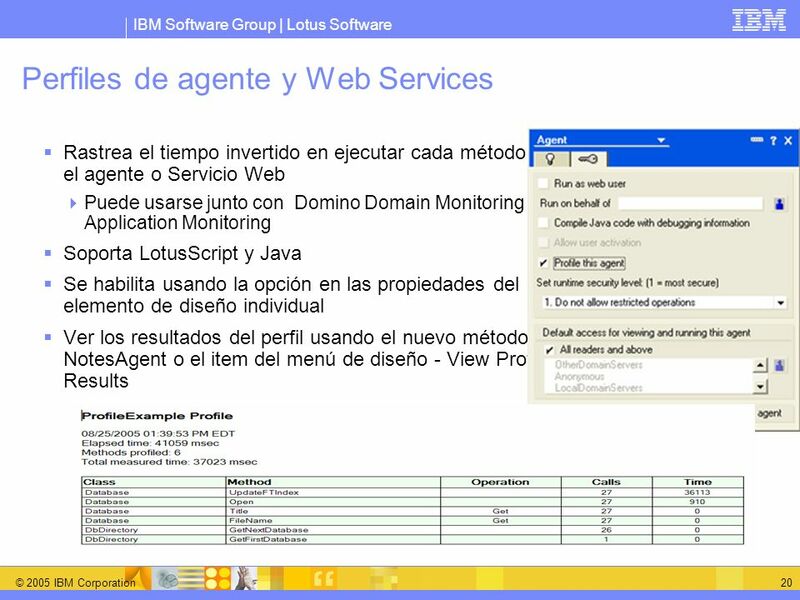 The top graphic is the properties box for a Java agent, web service or script library. The option “compile Java code with debugging information” should be enabled for the agent, web service or script library you want to debug. 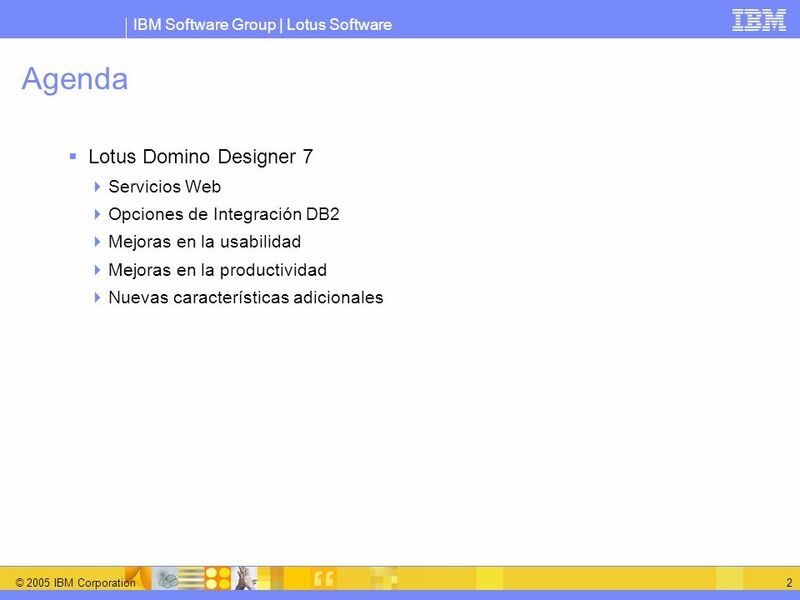 The bottom graphic is the new option in the Domino Designer 7 menu. Here is where you enable the option to let the 3rd party debugger attach the the ports available to the debugger. Note to speaker: Only local design elements can be debugged in Server based agents, web services and script libraries cannot be debugged. 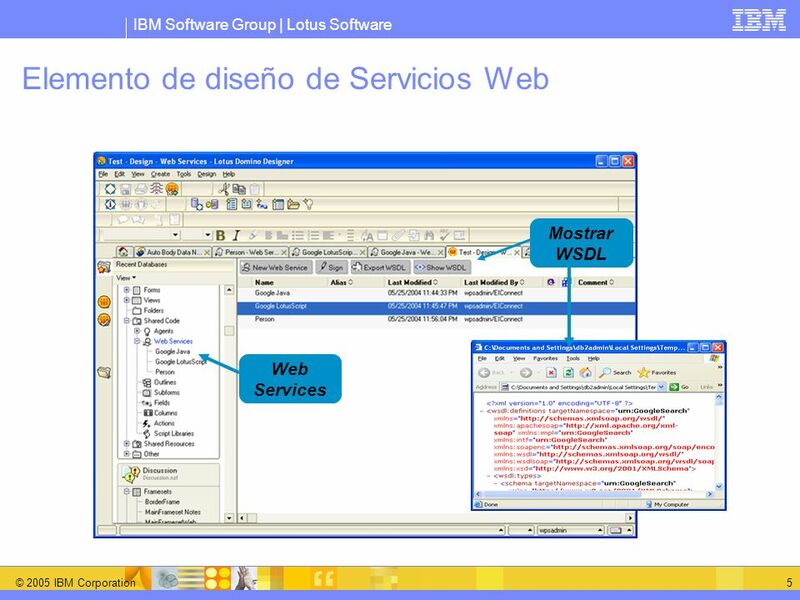 Rastrea el tiempo invertido en ejecutar cada método en el agente o Servicio Web Puede usarse junto con Domino Domain Monitoring – Application Monitoring Soporta LotusScript y Java Se habilita usando la opción en las propiedades del elemento de diseño individual Ver los resultados del perfil usando el nuevo método NotesAgent o el item del menú de diseño - View Profile Results The Code profiling feature lets you produce a document listing the time spent running individual methods in Java and LotusScript agents and web services. You can then use this information to see the amount of time spent running the methods in the agent or web service. The bottom graphic is the profile results from an agent or web service. This profile can be accessed from the agent or web service design list through the Domino Designer menu Agent >> View Profile Results or through the new NotesAgent method GetPerformanceDocument. 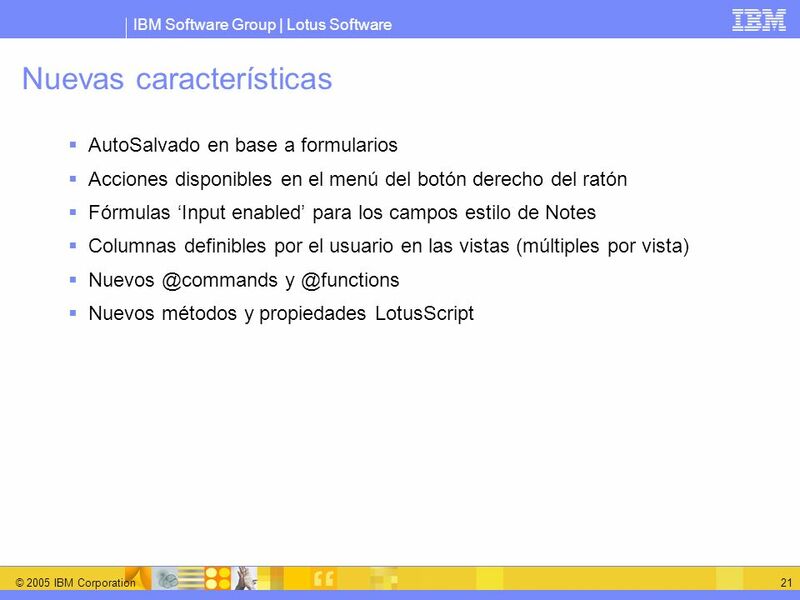 AutoSalvado en base a formularios Acciones disponibles en el menú del botón derecho del ratón Fórmulas ‘Input enabled’ para los campos estilo de Notes Columnas definibles por el usuario en las vistas (múltiples por vista) Nuevos métodos y propiedades LotusScript This is simply a list that is expanded in detail in the next slides. You can move to the next slide. 22 ¿Qué hace el AutoSalvado? ¡No es igual que hacer un Archivo-salvar! 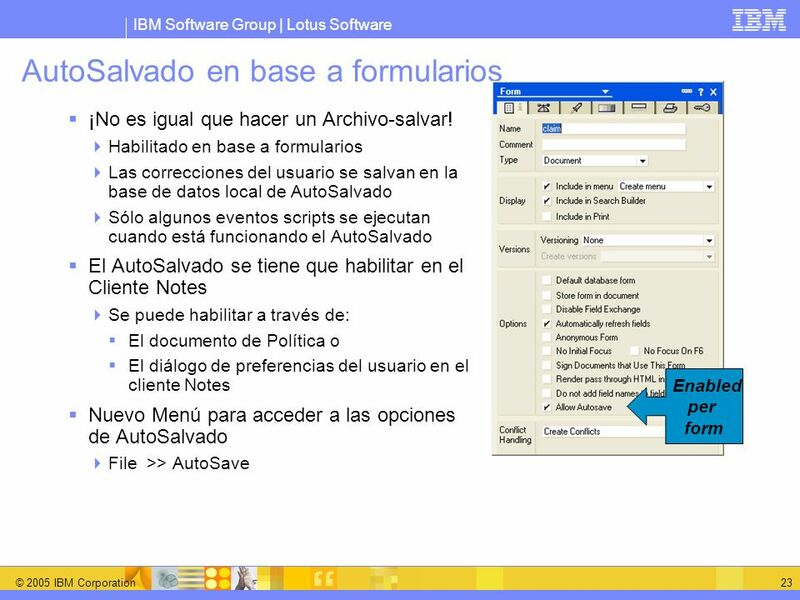 Habilitado en base a formularios Las correcciones del usuario se salvan en la base de datos local de AutoSalvado Sólo algunos eventos scripts se ejecutan cuando está funcionando el AutoSalvado El AutoSalvado se tiene que habilitar en el Cliente Notes Se puede habilitar a través de: El documento de Política o El diálogo de preferencias del usuario en el cliente Notes Nuevo Menú para acceder a las opciones de AutoSalvado File >> AutoSave Enabled per form This slide stresses that the developer needs to enable autosave in their custom databases. The ND7 mail template memo form has this property enabled. 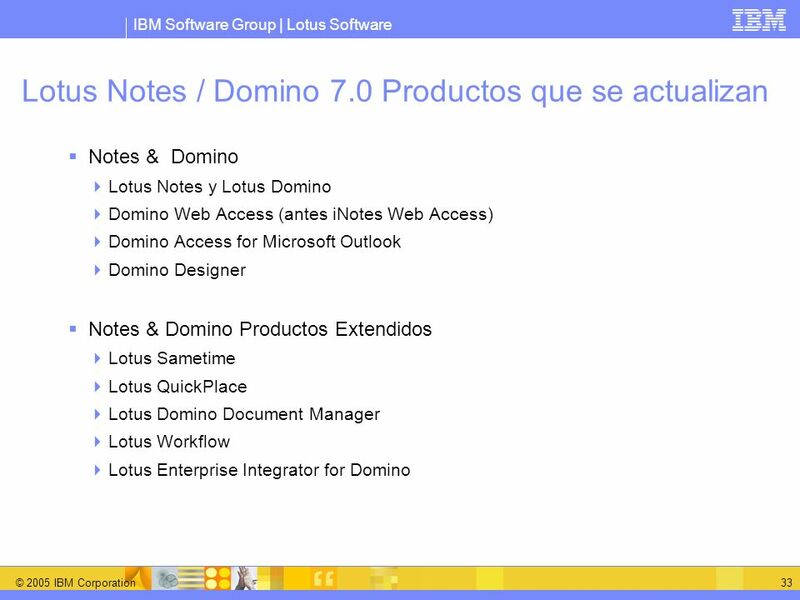 This slide stresses that autosave must be enabled on the Notes client through User preferences or through a policy document in the Domino Directory. The Desktop Settings document >> Preferences tab, Basics subtab is where this can be set in the Domino Directory. 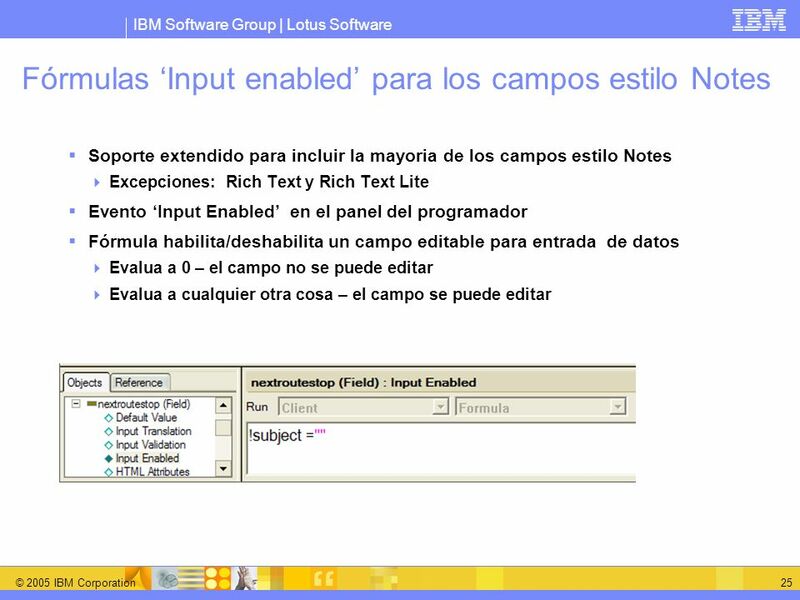 Soporte extendido para incluir la mayoria de los campos estilo Notes Excepciones: Rich Text y Rich Text Lite Evento ‘Input Enabled’ en el panel del programador Fórmula habilita/deshabilita un campo editable para entrada de datos Evalua a 0 – el campo no se puede editar Evalua a cualquier otra cosa – el campo se puede editar Skip if short on time You now have control over the edit state for individual fields in a form. (Note: This feature is partially implemented pre-7 for Native OS style fields) The “Input Enabled” event is now supported with all field types and styles (Notes style and Native OS style) with the exception of rich text and rich text lite fields. This can provide the developer with more options to conditionally control edit-enabled state of individual editable fields through the form. Despliega una dialogo con una lista de las carpetas donde se pueden encontrar los documentos seleccionados. 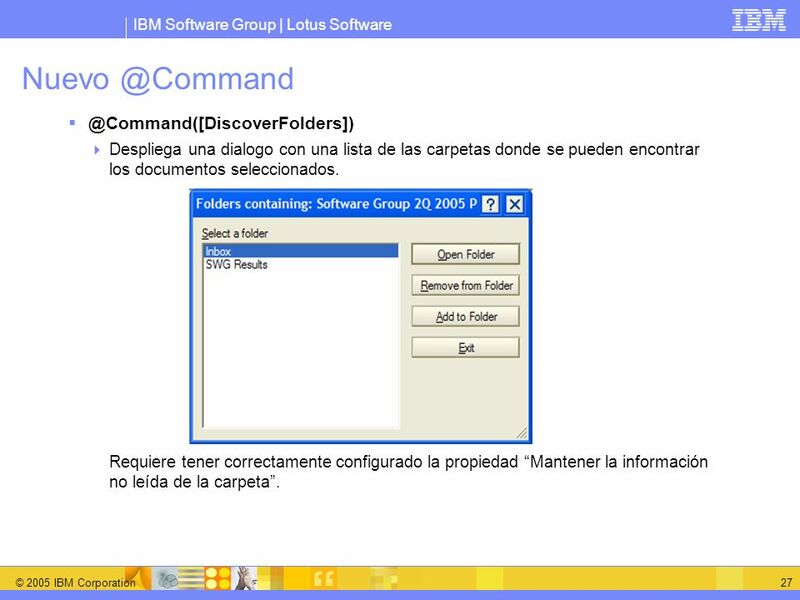 Requiere tener correctamente configurado la propiedad “Mantener la información no leída de la carpeta”. 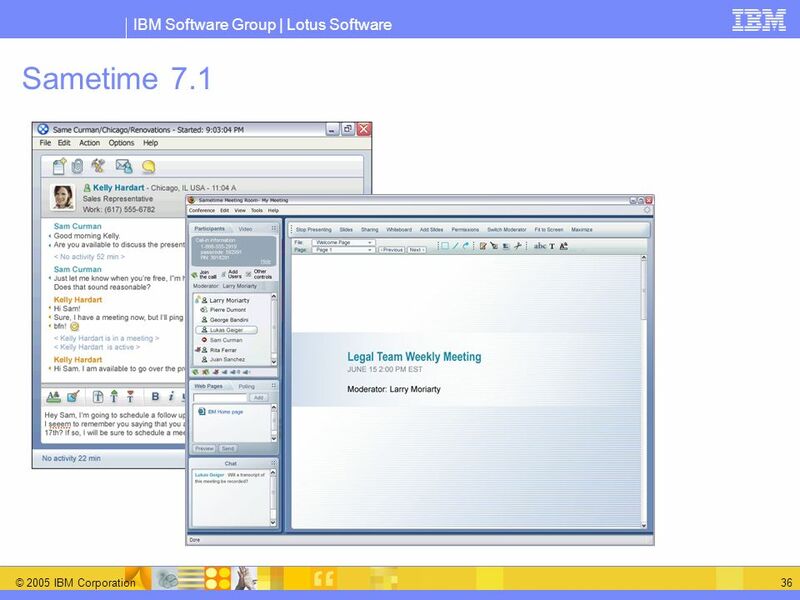 The user productivity feature is found in the ND7 mail template design and allows users to quickly determine which folders reference the current document. This feature can be used in any Notes database and is supported by the new property for the embedded outline. Usa un campo de entrada y fórmulas ocultas. 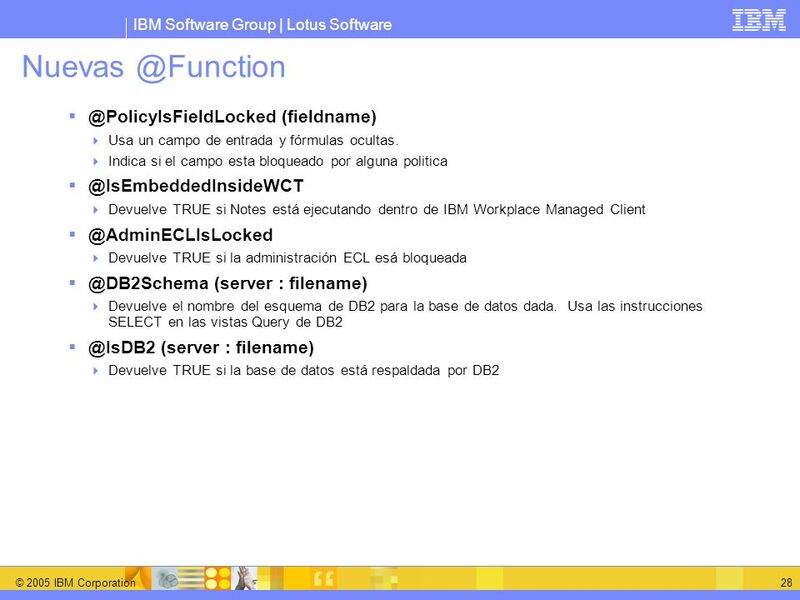 Indica si el campo esta bloqueado por alguna politica @IsEmbeddedInsideWCT Devuelve TRUE si Notes está ejecutando dentro de IBM Workplace Managed Client @AdminECLIsLocked Devuelve TRUE si la administración ECL esá bloqueada @DB2Schema (server : filename) Devuelve el nombre del esquema de DB2 para la base de datos dada. 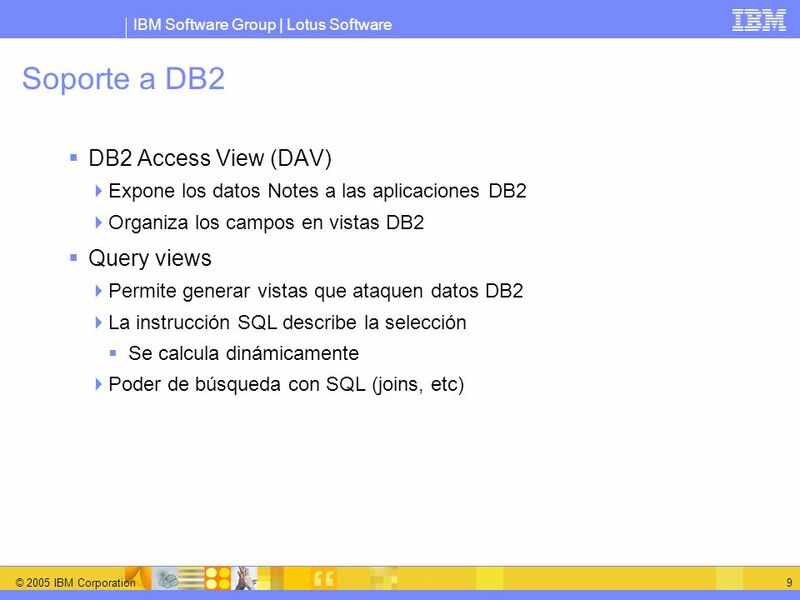 Usa las instrucciones SELECT en las vistas Query de DB2 @IsDB2 (server : filename) Devuelve TRUE si la base de datos está respaldada por DB2 These help you make use of the new functions available in Notes and Domino. @PolicyisFieldLocked works with the new locking option for policy documents in the Domino Directory. Policy documents can now prevent a user from changing a Notes client setting. 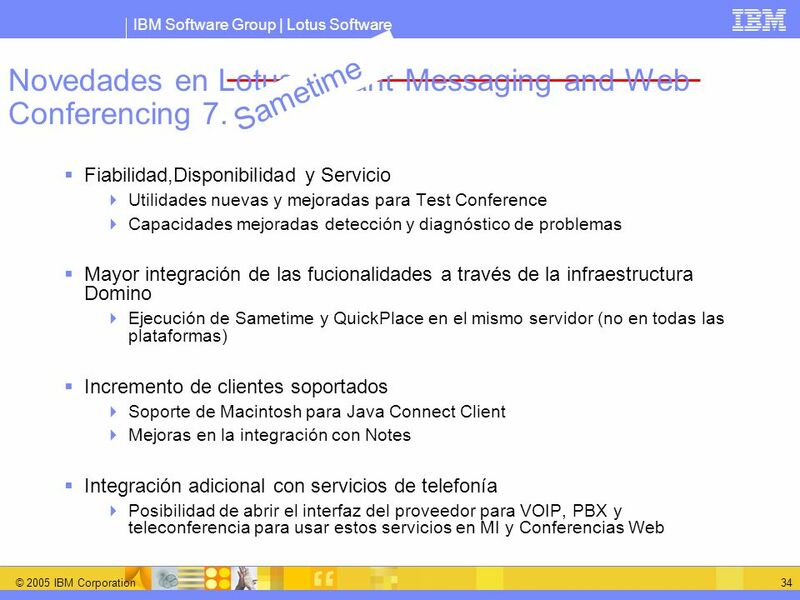 @IsEmbeddedInsideWCT can be used when running Notes 7 embedded in the IBM Workplace Managed Client @DB2Schema help the developer with DB2 enabled databases and query view formulas. 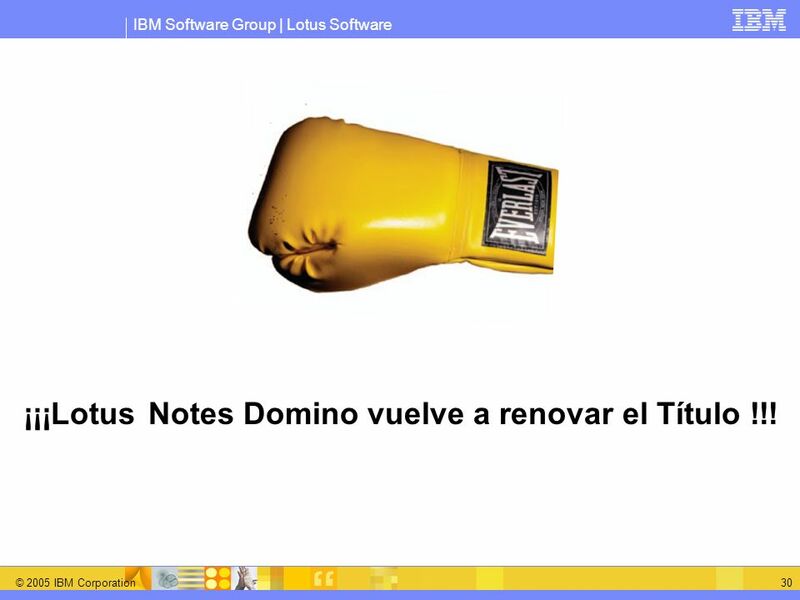 30 ¡¡¡Lotus Notes Domino vuelve a renovar el Título !!! 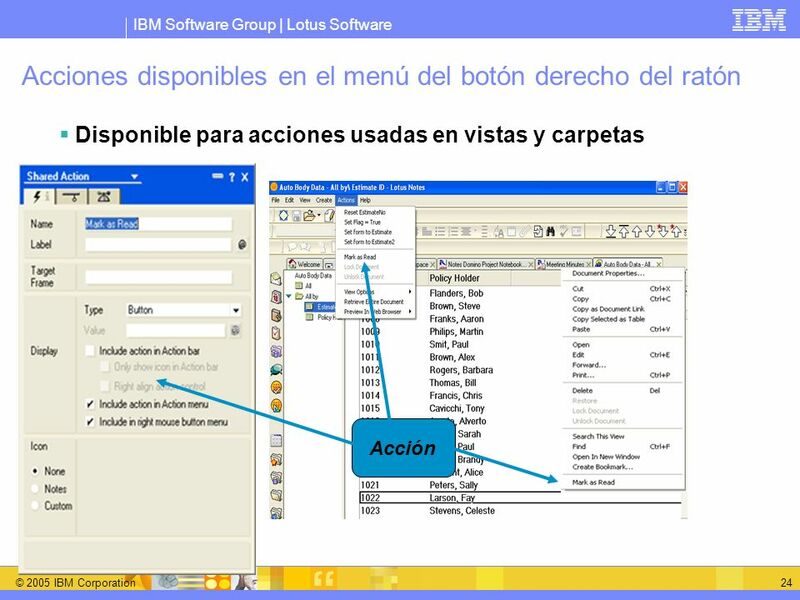 Soporte para Netegrity Siteminder Soporte para habilitar aplicaciones adicionales del escritorio Detalles de como habilitar las aplicaciones adicionales Mejoras en los servicios Mensajes de error mejorados Instalación de DE monitorizada Actualización de plataformas soportadas N/D 6.0.3, 6.5.2, y 6.5.3 Navegadores: IE 6.0, Safari (solo Mac OSX) S.O. : Win XP, 2000, 2003 Server; AIX 5.1, AIX 5.2; Solaris 8/9, iSeries V5R3 Netegrity Siteminder: Centralized Security infrastructure for managing user authentication and access to websites. We’ve add support for Netegrity Siteminder for SSO support. We’ll add support for additional desktop applications allowing save and open to/from DomDoc. We do a better job of providing more meaningful error messages and logging information for faster problem resolution. We’ve updated the platforms that we support, both operating systems and Domino versions (example: we will no longer support R5). And finally, we continue on our path of integration testing among common versioned products to ensure that work well together. 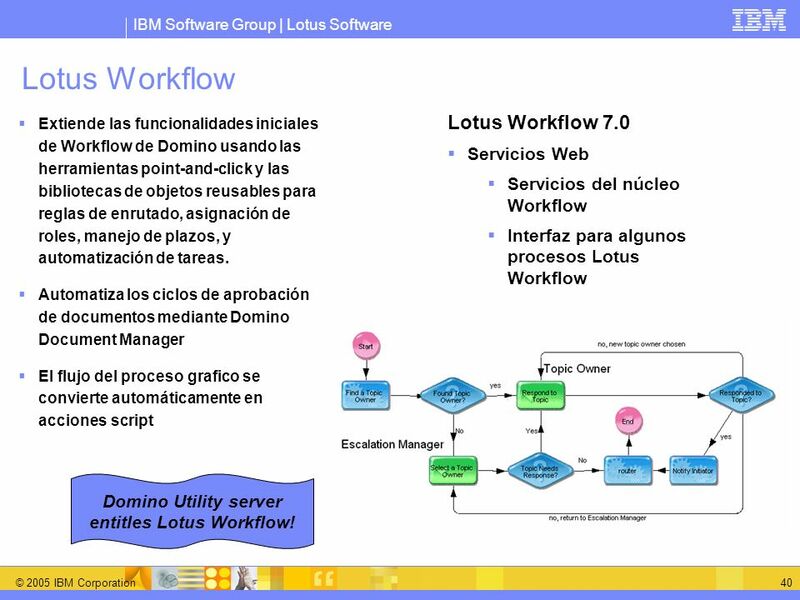 Extiende las funcionalidades iniciales de Workflow de Domino usando las herramientas point-and-click y las bibliotecas de objetos reusables para reglas de enrutado, asignación de roles, manejo de plazos, y automatización de tareas. 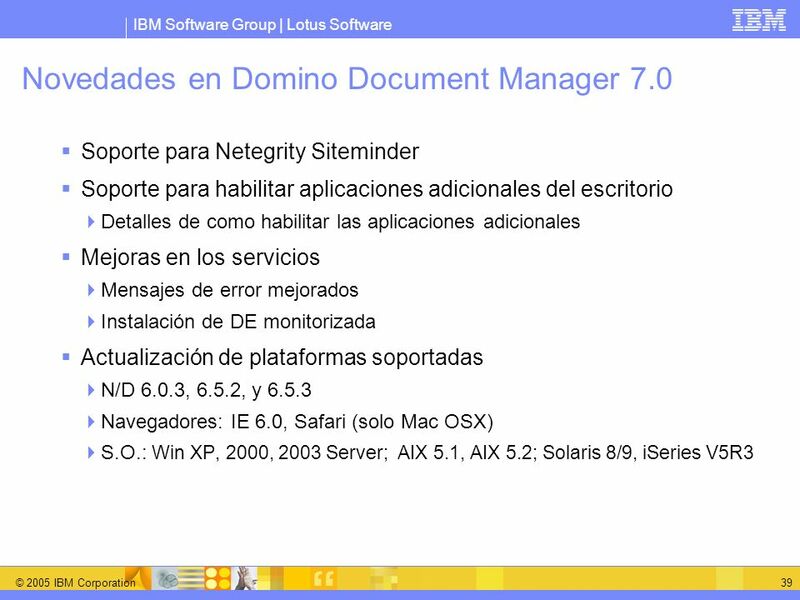 Automatiza los ciclos de aprobación de documentos mediante Domino Document Manager El flujo del proceso grafico se convierte automáticamente en acciones script Lotus Workflow 7.0 Servicios Web Servicios del núcleo Workflow Interfaz para algunos procesos Lotus Workflow Domino Utility server entitles Lotus Workflow! Soporta la creación de componentes y aplicaciones de procesos de negocio orientados a documentos. Automatiza los procesos de empresa típicos, como informes de costes, cambios de petición o gestión de proyectos. Ayuda a reducir los costes de desarrollo. Se requiere poca o ninguna formación gracias a su fácil uso, entorno de diseño visual de alto nivel Crea componentes J2EE reutilizables. Pocas barreras para entrar, es fácil empezar. 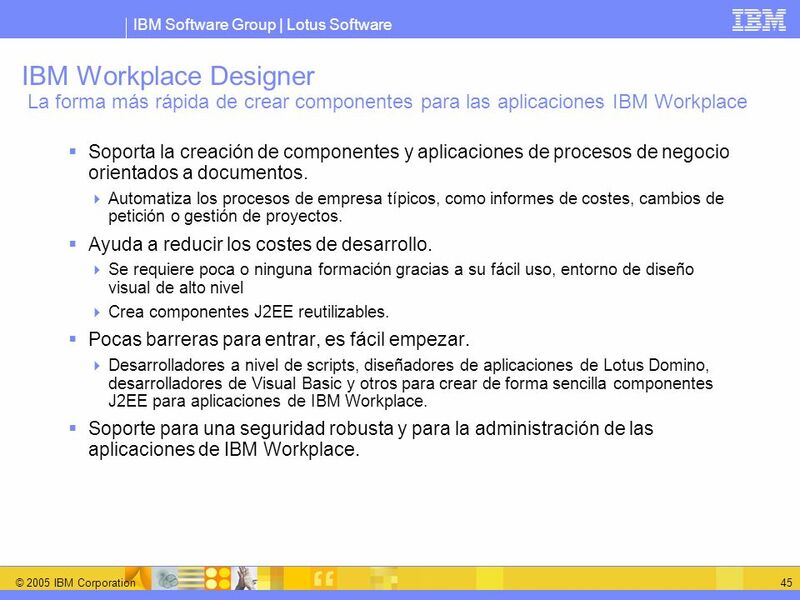 Desarrolladores a nivel de scripts, diseñadores de aplicaciones de Lotus Domino, desarrolladores de Visual Basic y otros para crear de forma sencilla componentes J2EE para aplicaciones de IBM Workplace. 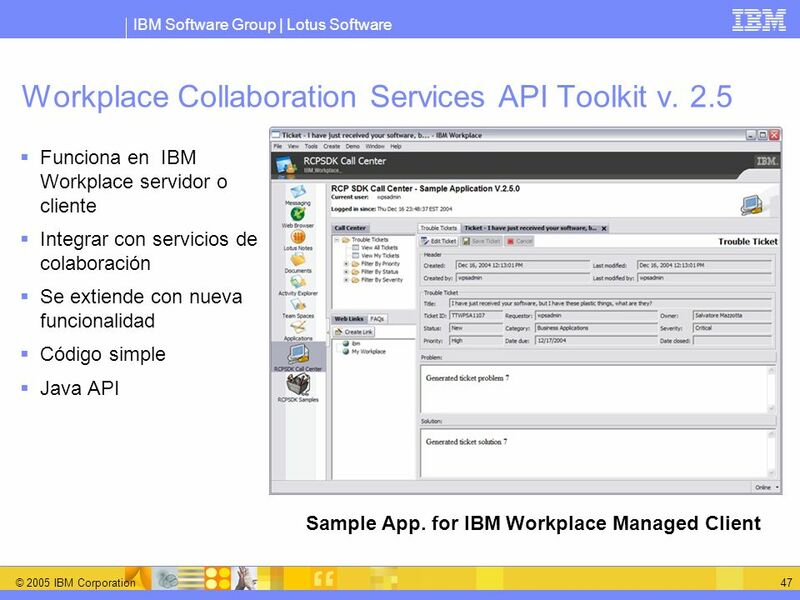 Soporte para una seguridad robusta y para la administración de las aplicaciones de IBM Workplace. IBM Workplace Designer 2.5 is the newly released product that is the fastest way to create components for IBM Workplace applications. 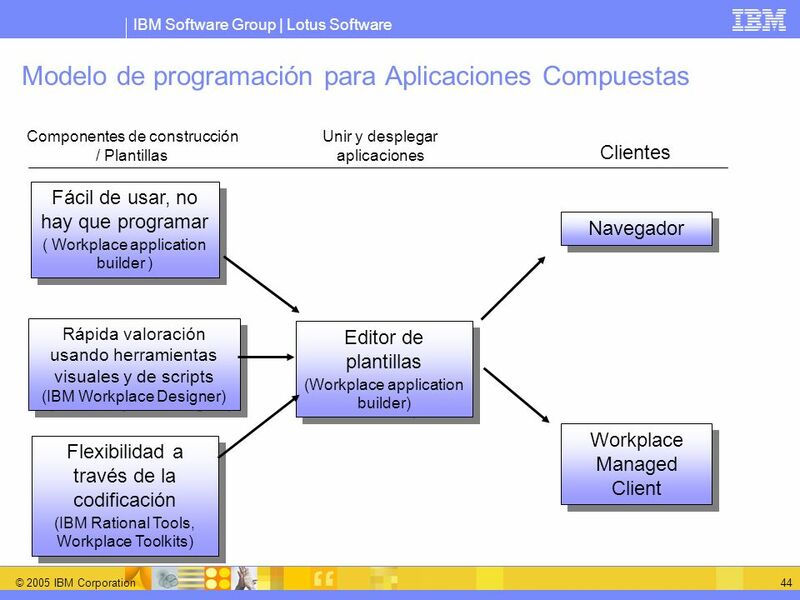 This slide lists the benefits of Workplace Designer, notice that the target user is a script level developer, Domino app developer or VB developer, J2EE skills are not required. 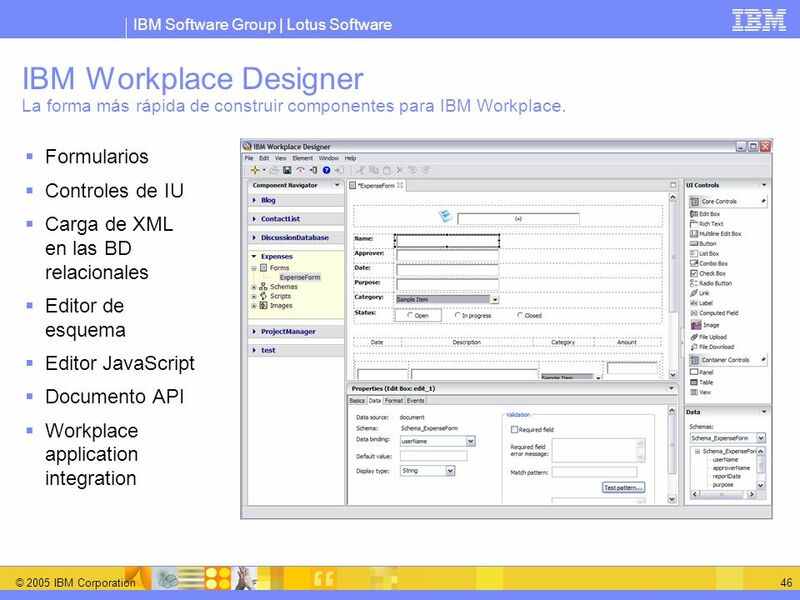 Workplace Designer provides businesses an easy to use, yet powerful tool for creating components for IBM Workplace composite applications. The underlying J2EE technologies are not exposed so that expertise in this area is not necessary to develop production applications. For individuals and teams that need the power and flexibility of Java, there are extensive APIs available that let you access the data and services provided by the IBM Workplace capabilities. 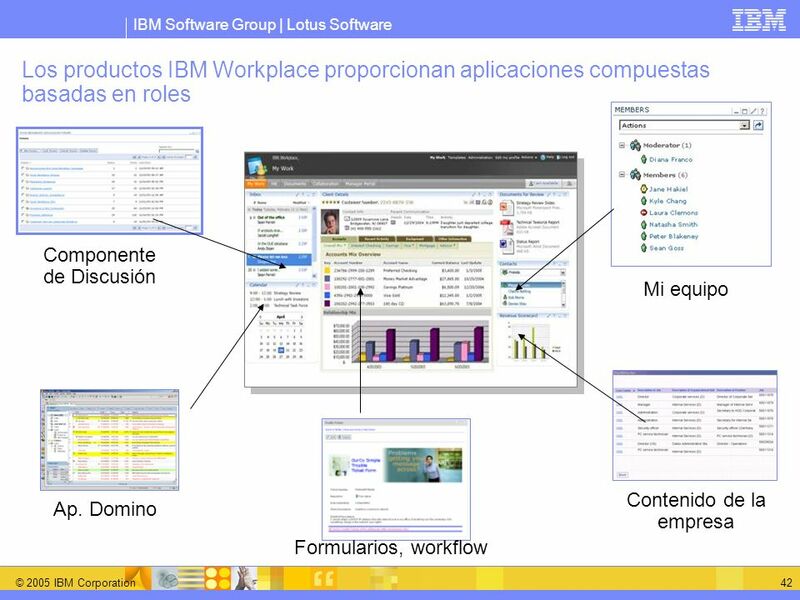 46 IBM Workplace Designer La forma más rápida de construir componentes para IBM Workplace. 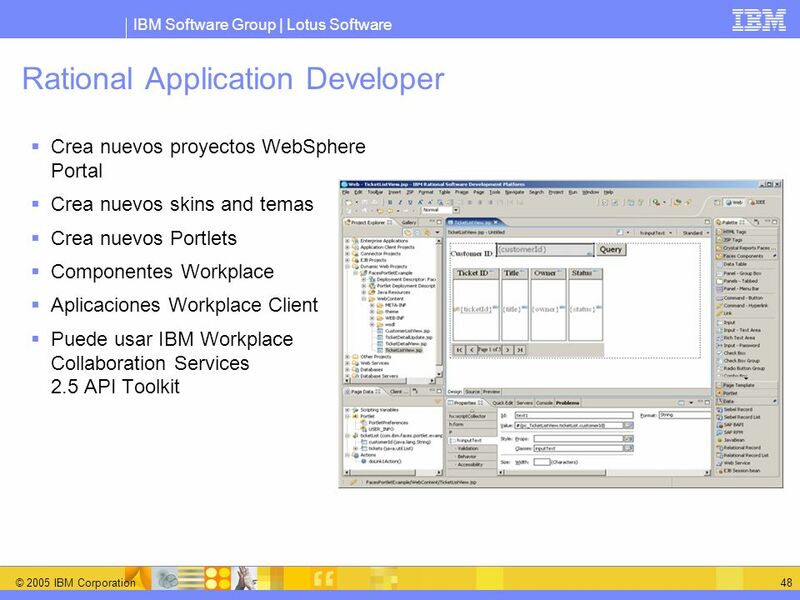 Crea nuevos proyectos WebSphere Portal Crea nuevos skins and temas Crea nuevos Portlets Componentes Workplace Aplicaciones Workplace Client Puede usar IBM Workplace Collaboration Services 2.5 API Toolkit We are not going to expand on Rational Application Developer in this session, but this is another tool from IBM that can be used to build and modify Workplace applications. Rational Application Developer has multiple capabilities and has a larger footprint than IBM Workplace Designer. Rational Application Developer is targeted at J2EE skilled developers, whereas IBM Workplace Designer is targeted at script level developers. 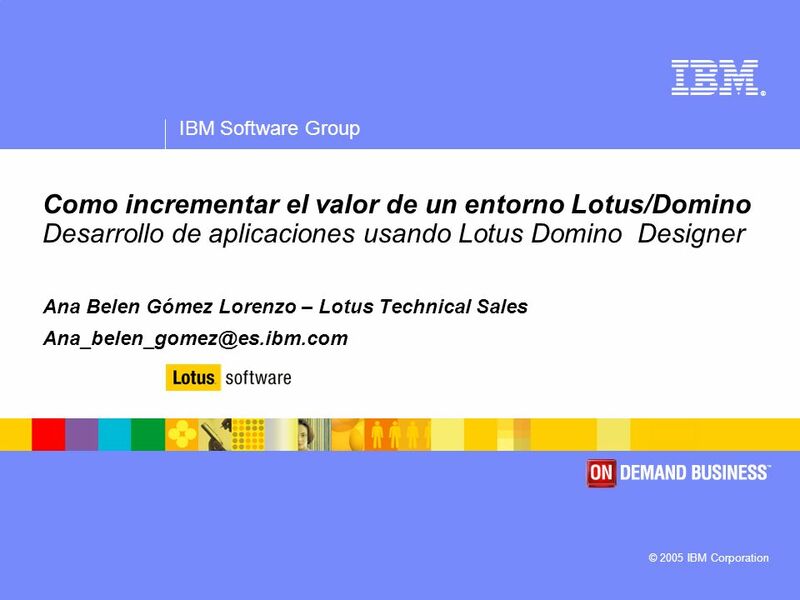 Descargar ppt "Como incrementar el valor de un entorno Lotus/Domino Desarrollo de aplicaciones usando Lotus Domino Designer Ana Belen Gómez Lorenzo – Lotus Technical." 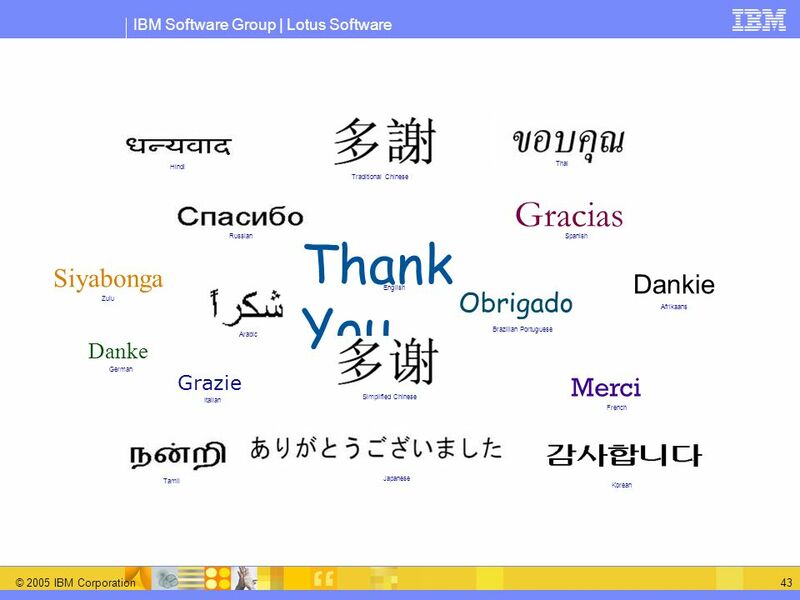 © 2007 IBM Corporation ® Gestión de entornos de portales. Gestión de Contenido Electrónico CONCEPTOS DE INFOPATH De Andrés Concha Bucaram.